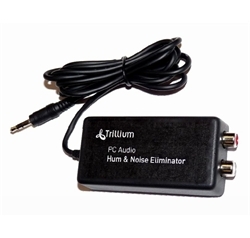 This Audio Hum and Noise Eliminator removes the annoying hum and high frequency noise that often occurs when you use your computer to play music or audio files through equipment such as amplifiers and mixing panels. It can also be used to remove the hum and noise that occurs when recording music from poorly grounded audio eqipment such as turntables or cassette players. By simply connecting your audio equipment via the compact Hum and Noise Eliminator, both of these problems are eliminated. Connection is simple and can be done in a matter of seconds. Just connect the Hum and Noise Eliminator to your computer's sound card line-out (for playing music from your computer) or line-in (for recording music to your computer) socket and then connect your audio equipment to the RCA sockets on the Hum and Noise Eliminator. This product is recommended for use with Golden Records Analog to MP3 / CD Converter. Sound card with line-out or line-in socket.